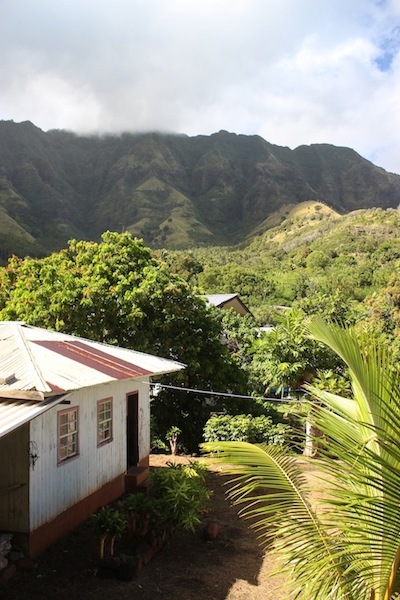 We've moved to the beautiful island of Tahuata, just 10 miles south of Hiva Oa. It is a more remote island with no airstrip and a population of about 600. The first bay (Hanamoenoa) we anchored in is one of the most beautiful bays I've ever seen. We were treated to turquoise water, a white sand beach, a forest of palm trees and even acrobatic manta rays that seemed to enjoy our company in the water. We would get up early (~6 am) to play with the manta rays, do boat chores in the afternoon and be in bed exhausted and happy by 8 pm. Our cruising mode had begun again! We traveled next a few miles south to the village of Vaitahu. Our days here have been so jam packed full of experiences, it's hard to digest all of the impressions. I've finally started to automatically say "Bonjour" instead of "Hola"... and the French I've learned in high school is coming back slowly. Tattoo artistry has a long tradition in the South Pacific and the Marquesans are famous for their intricate and elaborate designs. I can come up with a lot of meanings and metaphors behind why I wanted another tattoo. But the main reason is because the Marquesan tattoos just look *really* super cool and I thought it would be a great memento from this trip. One of the guide books mentions a famous tattoo artist in the village of Vaitahu, so we started asking around and learned that his name is Felix. It was interesting to see all the beautiful tattoos on the locals and learn that Felix was the artist behind them. Apparently the mayor's name is also Felix, where we were first directed to...oooops. Once that confusion was sorted out, the mayor's wife pointed to the top of the mountain and said Felix lived there. I guess you have the whole sweaty walk up to contemplate your tattoo and see if you're really serious. Luckily Felix didn't quite live at the top of the mountain, so the walk was somewhat shorter than expected. curious cruisers come knocking, but few are serious. Who knows? I spent the evening finalizing my rough design and determining the size and placement. It was hard for me to sleep with the excitement building. The next morning, Felix was at the dock to pick us up and drove us to his studio, his old parent's house. His studio looked like a very rustic abandoned shed, not your usual downtown tattoo parlor, but I wasn't deterred, for whatever reason. He has many pictures of cruisers he has tattooed, his machine looked modern enough and his practice seemed clean, from what I could tell. So...I went for it and I'm so glad that I did! Here's what I went in and what I came out with. I am totally in love with my Marquesan turtle! To make the day even better, the guys went spear fishing with a local (Jean) after lunch, so I had the boat totally to myself for 3 hours. My soul was screaming for joy and I loved every minute of my alone time. They came back with 3 fish, which made for a great meal on board. After Felix was done the tattoo, he said I was part of his "tattoo family" and invited us for a meal at this house. We ate delicious BBQ chicken surrounded by the lush hillside of his home. What a special experience! Thanks to Busby's French and social skills, we've had so many unique experiences on this island that I'll never forget. Chris and Busby also got tattoos. Chris designed the outline with inspiration from the manta rays we saw and Felix filled in the motif. I guess you guys are totally in a position to be elitest about visiting islands that don't have air strips! Island hopping in the south pacific sounds like SOO much fun! Wow Love love love your turtle AM! ... to slow down and keep the "cruising spirit" always with me "